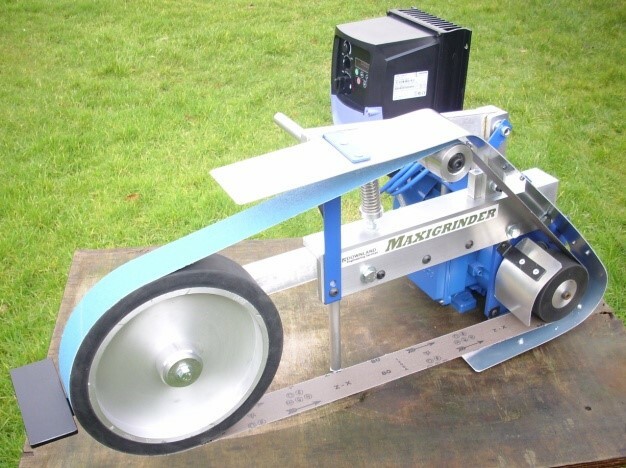 The Direct Drive Maxigrinder ‘The professionals choice’ belt grinder. 2Hp direct drive, 240v single phase will run from conventional hhld supply, Invertek Optidrive speed control range from 0–2800 RPM with full power, at 1400-2800 power is reduced proportionally relative to the speed from 1400 down to 0 RPM. 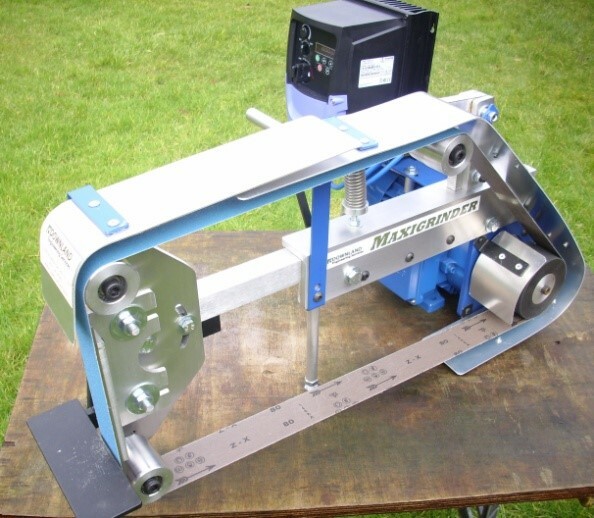 Takes 50 x 1800 to 50 x 2000 belts, angle-adjustable platen head, approx 15deg either side of vertical, worktable is also adjustable and extendable for when head is tilted, removable tool arm so a range of accessories can be fitted. Approx 45Kg, .6m wide .6m high x .75m long. Contact me for the latest information pack and current prices. 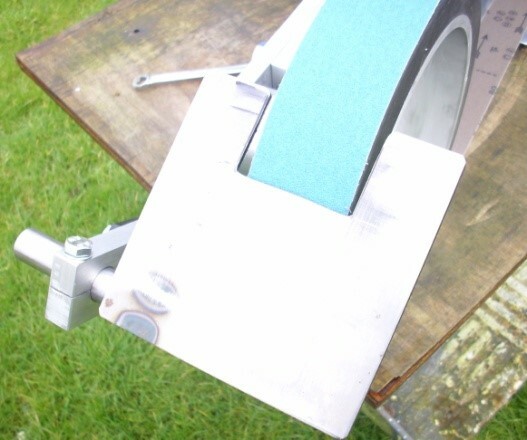 Direct Drive Maxigrinder Accessories We now offer a range of accessories for the Maxigrinder comprising of a kit of parts including the following: 30mm; 75mm; 150mm and 250mm contact wheels; an additional arm with a multiwheel head which makes swapping wheels very easy; a conventional worktable; a scalloped worktable; a cut out table and a finger rest. 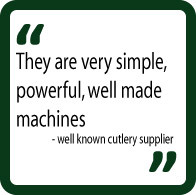 It can be purchased either as a complete kit of as component parts. 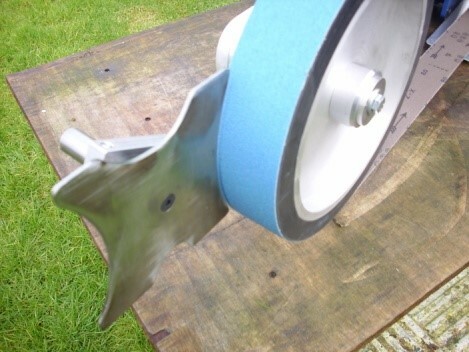 300mm (12″) and 350mm (14″) contact wheels are also available. Contact for current prices. 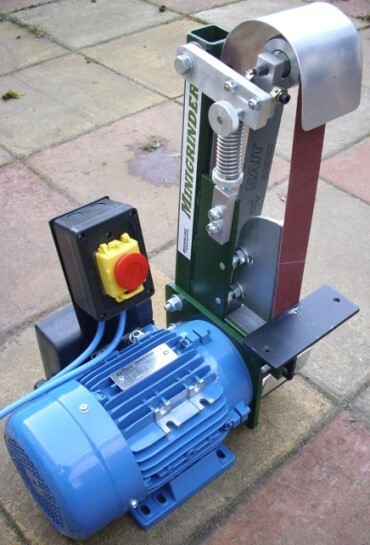 Multiwheel head Any small wheels with a 19″ bore fit directly on to the shaft and any contact wheels with a 35mm bore fit directly onto the head making it possible to have a range of wheels that are very easily changed by simply undoing one small bolt. 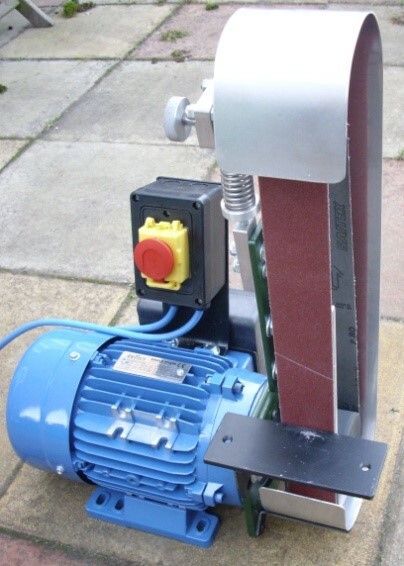 The Direct Drive Minigrinder 240 volt single phase 1.5 hp motor, fixed speed at 1400 rpm. 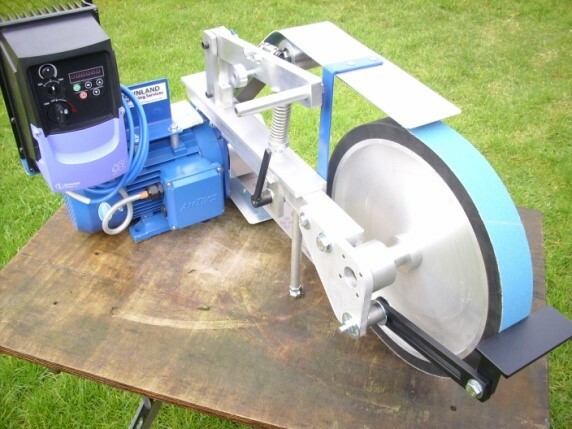 This is a very powerful compact grinder, comes out of the box ready to use. 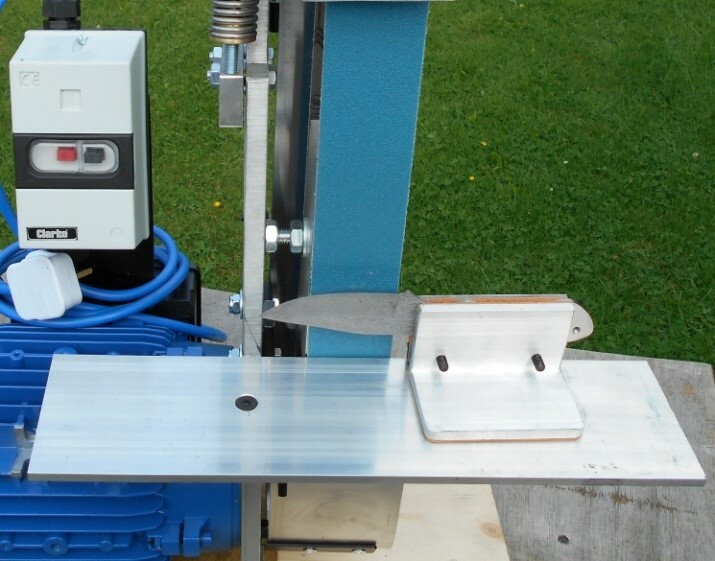 Capable of working all day and removing serious amounts of metal. Table is fully adjustable for angle. 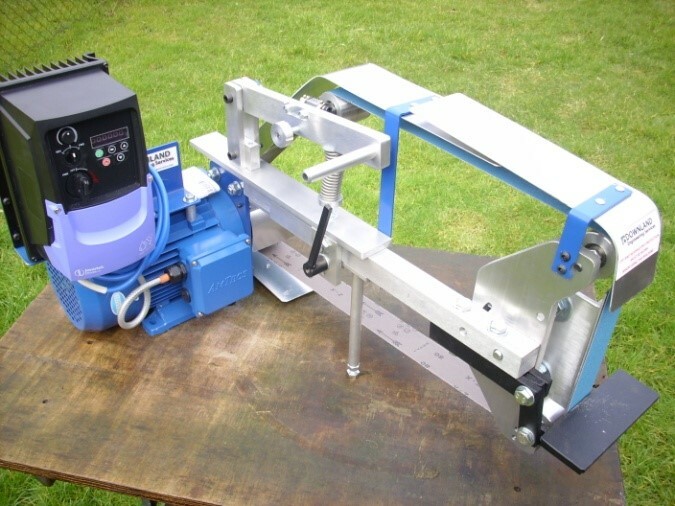 Takes 50 x 1065 belts simple one knob tracking set up, crowned top pulley for very stable belt running, complete with jig and table extension for very accurate bevels. Approx 28kg, 580mm high x 380mm wide x 270mm deep. Contact for current price. 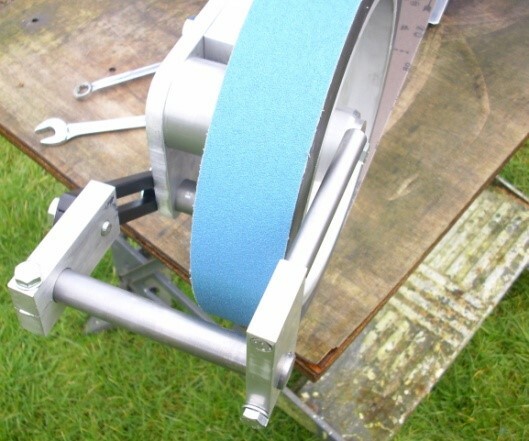 Grinder Belt drive wheels. 100mm dia x 55 wide, tyre is 90 shore polyurethane on aluminium hub which is 70mm in overall length available in 19mm bore for direct mounting on motor or shaft. 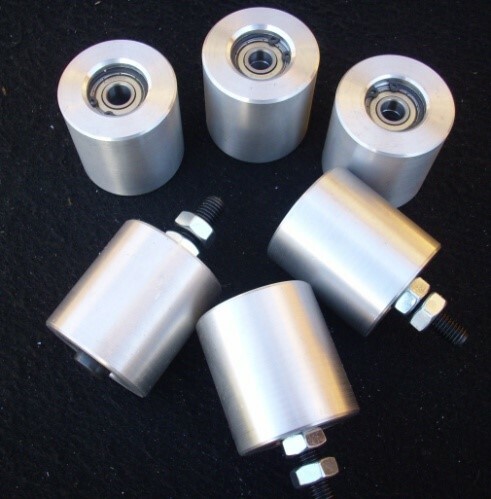 20mm bore for mounting to a shaft and 24mm for direct mounting to a motor. Location is by 8mm grub screw either onto flat on the shaft or into the keyway on a motor. £48 each. 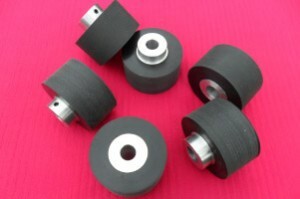 Platen rollers. 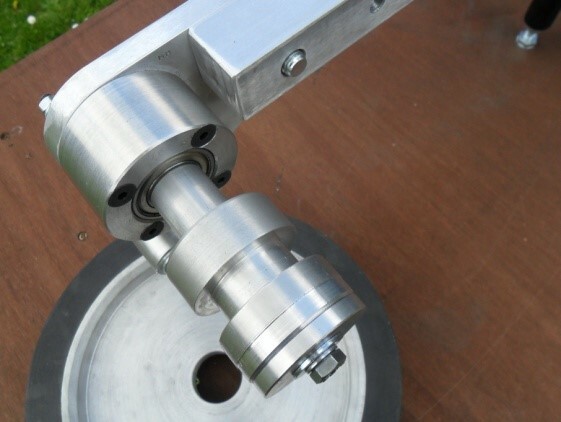 Billet aluminium, 50mm dia x 55mm wide, fitted with 10m ID bearings and M10 socket head bolt. £36 each / £68 pair. Tracking Pulleys. 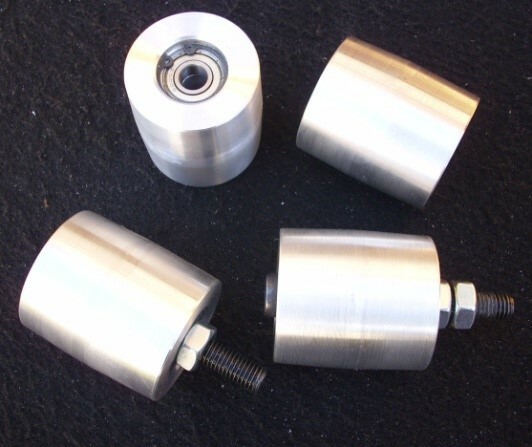 Billet aluminium, 50mm dia x 55mm wide, crowned and fitted with 10mm ID bearings M10 socket head bolt. £38 each.